The Lewis R. French motored into Great Cove with sails furled during an afternoon stillness Wednesday; yesterday morning, she charged out with a 15-knot tail wind. Here she is moored near the WoodenBoat School, which her passengers visited as part of their tour. The schooner was launched in 1871 out of Christmas Cove, Maine, where she was built by the French brothers and named after their father. In her youth, her life was varied and hard: Among other things, she freighted bricks, granite, fish, lime, firewood, and Christmas trees. Now, the French is a classic and almost luxurious vessel out of Camden, Maine. 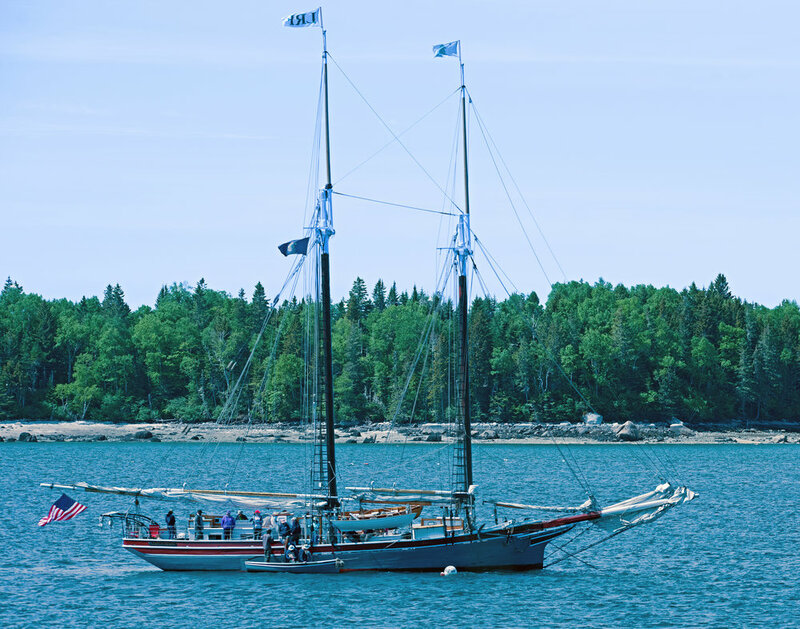 She takes visitors out for leisurely, week-long sails among the islands and coves of Down East Maine. Here, the last passengers are returning from ashore, and the French hoists sail. She tacks into the wind and then veers off with the wind behind her.